Incredibly it can take the average ink cartridge as long as 1000 years to fully decompose and in the UK alone we throw away an estimated 30 million cartridges every single year. This means that every single ink cartridge that has so far been thrown in the rubbish is still sitting in a landfill waiting to decompose and the pile is growing ever larger by the day. The fact is that most Lexmark and HP Inkjet Cartridges can be recycled. They can be completely cleaned out, refilled with virtually the same high quality of ink, and then resold at lower prices. Another alarming fact is that it takes roughly 2.5 ounces of oil to create each new ink cartridge that you place in your printer. Oil is a non-renewable fossil fuel that simple cannot be replaced. By recycling cartridges we really are doing our bit to cut down on a consumption habit that is literally destroying the environment we live in. The benefits of recycling ink cartridges aren't just environmental either. Recycled ink cartridges are typically much cheaper than their brand new counterparts. Because the main components of the cartridge do not need to be created from new the process is much cheaper. It can also be done by a range of suppliers and vendors rather than large manufacturers. We carry a stock of recycled or remanufactured ink jet cartridges. These must meet our exacting standards before they can be sold and this means that they must meet or beat the specifications of the original ink cartridges. Once a used ink cartridge is received it is first inspected to ensure that it is suitable for recycling. It is fully disassembled with each part being individually inspected and replaced if necessary. It is fully cleaned and then reassembled before being refilled with high quality ink that is of at least an equal standard to the original ink. All recycled cartridges are print tested to ensure that there are no faults and then they are sealed and shipped. Our recycled ink cartridges are not only of a very high quality they are also notably less expensive than their original counterparts. We supply recycled ink cartridges for most major brands so shop around the site to find the cartridges you are looking for. 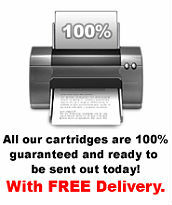 If you can't find the cartridges for your printer then don't hesitate to contact us. We may be able to supply them but haven't had chance to list them on the site yet. Recycling ink cartridges and buying recycled cartridges is an excellent way to help protect the environment and save a little money in the process even if you haven't recycled your own cartridges. It can also be a good way to donate to charity. Many recycled cartridges were originally donated to charitable organizations. These are then sold to companies that remanufacture cartridges and resell them. By buying recycled cartridges you could be helping any of a number of charities.